Surface disinfectants are chemical substances that are applied to non-living objects and surfaces for the purpose of destroying microorganisms. The increasing health concern among people is driving the surface disinfectant market as the hard surfaces throughout healthcare facilities can harbor dangerous pathogens for weeks. They are designed for everyday use in order to reduce healthcare associated infections. These surface disinfectants are easy to use, convenient, sturdy, and durable. The Surface Disinfectant market was valued at $488.63m in 2017 and is projected to reach $876.43m by 2023, growing at a CAGR of 10.1%. The market will be driven by the widespread adoption of surface disinfectants in clinics and hospitals. This will be complemented by the initiatives of various governments to promote these products and prevent the spread of diseases. Surface disinfectants differ in antimicrobial activity, toxicity, instrument corrosion, and material and glove compatibility. The primary usage of these disinfectant products is to prevent infectious diseases. The rising need to improve hygiene in hospitals, clinics, and ambulatory surgical centers to prevent the spread of infections among patients and staff has driven the demand for surface disinfectant products. There are various forms of surface disinfectants, namely sprays, liquids and wipes, offering customers a wide variety of options to choose from depending on their convenience. This Surface Disinfectant Market report comprises pricing analysis for different types of disinfectants employed in hospitals. The growing demand for high quality surface disinfectants across the globe is due to the increasing need to improve hygiene in hospitals, clinics, and ambulatory surgical centers to prevent the spread of infections among patients and staff. Also the market is driven by the growing number of laboratories and the rising awareness among people about personal hygiene. 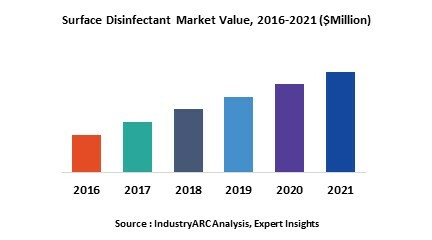 The rising disposable incomes of people in emerging countries is also one of the major factors for the growth of the surface disinfectant market. The heavy adoption of UV radiation as a substitute for surface disinfectants is a major challenge for the market. Ultraviolet germicidal irradiation technique kills or restricts the effects of microorganisms by attacking their DNA and finishing the nucleic acids. The increased adoption of pre sterilization and practice of disinfecting medical instruments also at as major challenges for the surface disinfectant market. The base year of the study is 2017, with forecast done up to 2023. The study presents a thorough analysis of the competitive landscape, taking into account the market shares of the leading companies. It also provides information on unit shipments. These provide the key market participants with the necessary business intelligence and help them understand the future of the Surface Disinfectant Market. The assessment includes the forecast, an overview of the competitive structure, the market shares of the competitors, as well as the market trends, market demands, market drivers, market challenges, and product analysis. The market drivers and restraints have been assessed to fathom their impact over the forecast period. This report further identifies the key opportunities for growth while also detailing the key challenges and possible threats. The key areas of focus include the types of products in the surface disinfectant market, and the types of formulations. Formulations of Surface Disinfectants: Sprays, Liquids and Wipes. Some of the key players mentioned in this report are 3M Company (the U.S.), STERIS Corporation (the U.S.), Johnson & Johnson (the U.S.), Cantel Medical Corp. (the U.S.), and The Clorox Company (the U.S.). Steris Corporation, Procter & Gamble Co., 3M Company, Diversey, Inc., and The Clorox Company were the dominant players of the surface disinfectant market in 2017, accounting for 60.8% of the total market share. Procter & Gamble Co. was the major company among the analyzed group of manufacturers in the global surface disinfectants market in 2017 with a market share of 22.3%. Owing to the increasing rate of Healthcare Associated Infections (HAIs) the concern for disease free environment is rising among the public, which would surge the demand for surface disinfectants. As per IndustryARC analysis, the revenue of the surface disinfectant market is expected to grow at a CAGR of 10.3% during the forecast period.